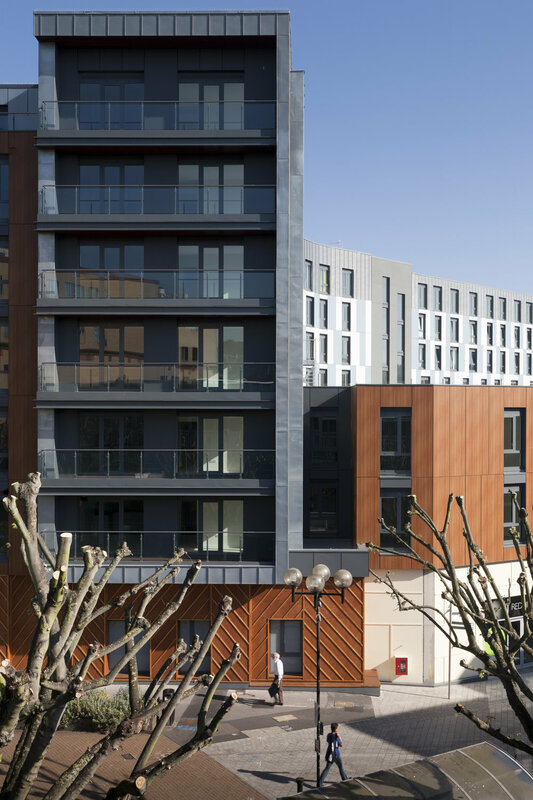 New-build residential scheme in Redhill town centre, Surrey for the developer/ contractor Hollybrook Homes in 2011. The new mixed-tenure homes were predominantly one and two-bed apartments, suitable for town centre living. The High Street location demanded retail at ground floor and around 60 secure car parking spaces. A private communal garden area comprising both hard and soft landscaping was included at first floor level as a valuable amenity for residents. The building is part new-build and part retained frame. This mixture of part retained RC frame and transfer deck, part new steel and RC frames to cores with a mixture of 6 and 4 storey timber frame, generated some challenging detailing, movement joint issues and shrinkage issues to overcome.